Fish had always been my love at the dining table. Fish of all types and fish of all kinds does always bring that extra smile to my face. This is the reason why I am just enjoying my stay here in Bengal. 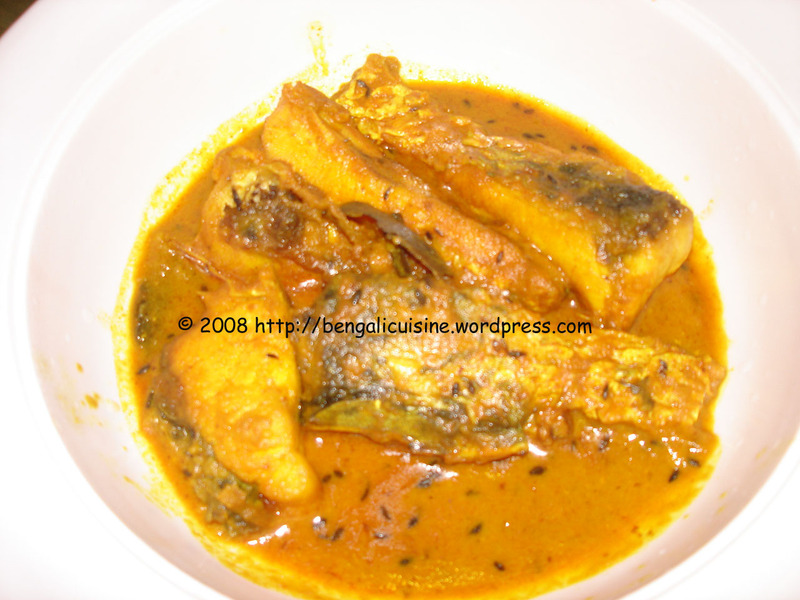 I feel that it is for all Bengalis wherever they are, fish is the best way to end the meal. My mom used to cook a very simple but the most delicious fish curry, when I used to go to school. I still like that fish curry. Here it is for all you readers. To tell you one simple trick to make this curry a bit more spicy, cook it with any kind of fresh fish brought from the market that same day. Half fry the fish pieces, potatoes separately and keep aside. Take oil in a wok and sauté the onions, and the bay leaves. Add all the spices to the sautéd onions and fry a bit. Add 2 cups of water and to it add the fried potatoes. Cook the broth till it starts boiling and then add the fish pieces, take care so that those do not break. Cook till the potatoes get fully cooked. Serve with rice and enjoy eating. 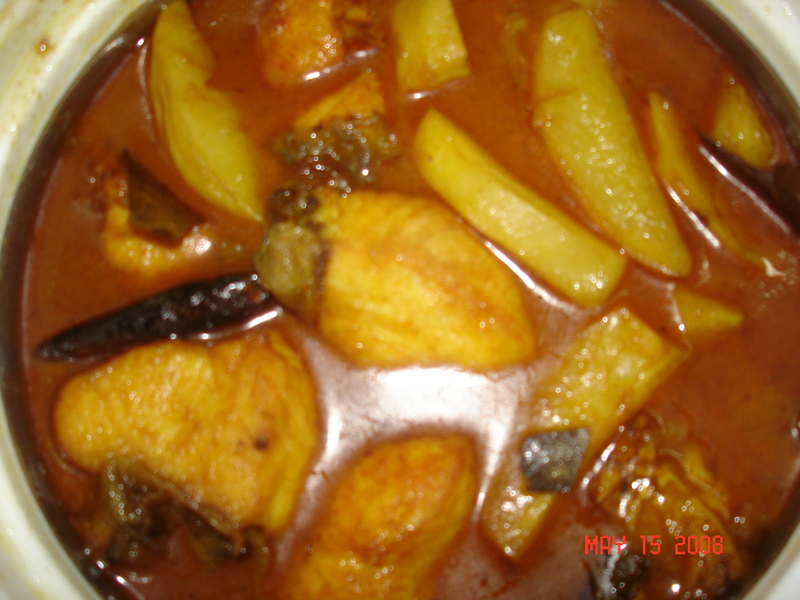 I prepared this dish with Rohu (rui maach), you can do the same with any fleshy fish. After a chicken dish and then a veggie delight here I am to tell you about the Bengal’s favorite platter – a fish curry. Fish had always been my favorite, though here in Bangalore you can’t find such good and fresh variety of fish, so I miss that “fish market” back in Kolkata, those shouts and the fishy smell. O lets not talk about that, it makes me home sick. So, Doi Rui is my mom’s special dish. She is a superb cook, and her specialty is this Doi Rui. Mix curd, onion juice of 1onion, ½ tsp ginger, ½ tsp of turmeric and ½ chilli powder in a bowl, add the fish pieces to them and marinate for 15mins. Heat mustard oil in a pan. Add the left out onions when the oil becomes hot. Sauté till the onions become golden brown. Add 1 tsp of ginger paste and fry little. Add the marinated fish to the pan add salt, turmeric powder, chilli powder, 3 green chillis and let it cook for sometime. Take care that the pieces do not break, so don’t disturb it much, let it just cook. Use a lid for fast cooking. Check after 5/7 mins whether the fish has become tender, if not then add little bit of water to it. A great smell from the kitchen tells you that your Doi Rui is done. Serve it with hot rice and enjoy that feeling of being at home, anywhere in this world .Happy cooking and happy eating. If you are really interested in having that Mom cooked taste then add just fry some potato pieces cut in like the French fry style and add them to the curry. If you are in real hurry and don’t have time to marinate the fish, then no problem at all. First fry the pieces and keep aside. Fry the onions and ginger paste as mentioned before. Add curd, turmeric powder, chilli powder, salt, ¾ green chilli and little bit of water. Allow it to boil for 3 mins and then add the fried fish pieces. Cook for 7 mins more and your doi rui is ready to serve.